To celebrate the introduction of this new stompbox, just choose NO SHIPPING and we'll ship it free in the usa! Or put a note in the ORDER COMMENTS area of a size and color of a free Analog Man shirt if you are not in the USA. 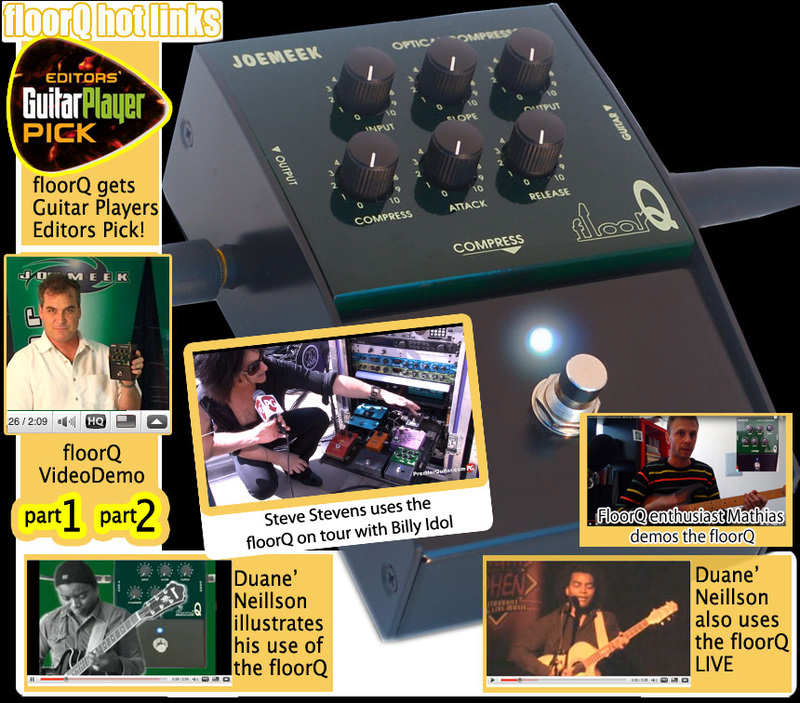 Analog Man carries the JoeMeek FloorQ compressor Pedal. This is basically a Joemeek Optical rack Compressor in a pedal. Comes with USA power supply. 12vAC, 1000mA. But it will work on almost any AC or DC power supply from 9V to 18V, as long as it puts out over 200mA (500mA to be safe). It uses a normal Boss style power jack (2.1mm) so you can find a power supply if you are not in the USA, or anyone can use the line6 outputs on their Voodoo Labs PP2+ to power this pedal. The floorQ is basically a Joemeek Optical Compressor in a pedal. "We realized that a lot of guitarists and bass players were buying our studio gear - such as the twinQ - just to put their guitars through" says PMI President Alan Hyatt. 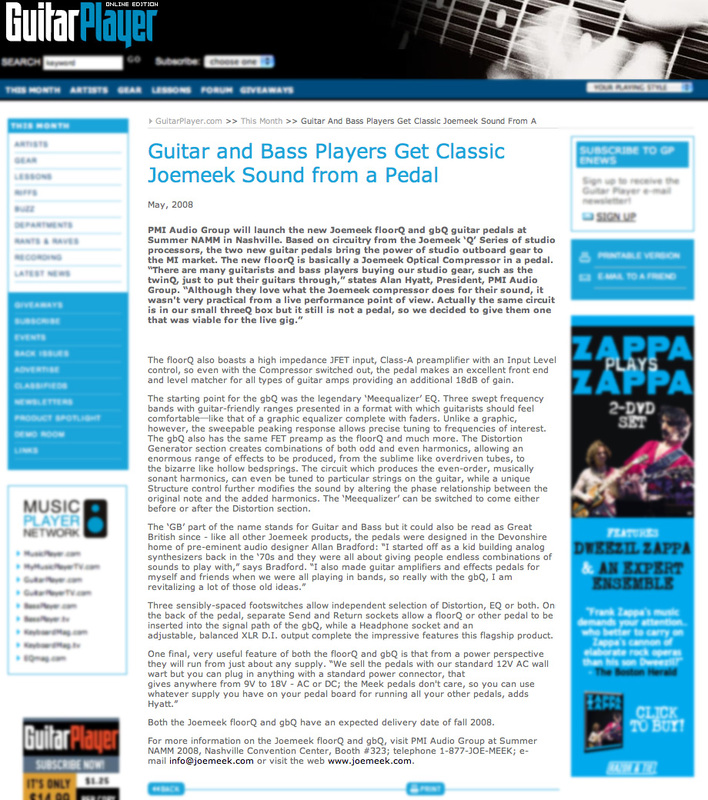 "They loved what the compressor did for their sound but it wasn't very practical from a live performance point of view. Actually the same circuit is in our small threeQ box but it still ain't a pedal, so we decided to give them one!" The floorQ also boasts a high impedance JFET input, Class-A preamplifier with an Input Level control, so even with the Compressor switched out, the pedal makes an excellent front end and level matcher for all types of guitar amps. This is a good pedal to get if you don't want to use your compressor as an EFFECT, which is what our analog man Comprossor and Juicer pedals are great for. This one can get some extreme sounds too, but is best used for more studio type effects where you don't really notice the compression until you turn it off and the guitar (or bass) sounds flat.